Hey there, and thank you for visiting my blog. 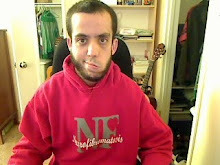 My name is Ilan and I was born with Neurofibromatosis (NF) Type 1. To learn more about me, read my first post. If you're curious about the blog's name, read this post. Check out my Facebook page www.facebook.com/ilanoflife. Please like it, and share with your friends, thanks!